Every year for my birthday I get to create a delicious birthday cake for myself and to share with others of course. As I reflect back on the years, I can honestly say I’m so grateful for all my experiences good and bad as they have made me grow and lead me to my purpose and passion in my life. My birthday used to be about drinking and partying but now it’s about having a day of self love and spending time with my family and loved ones. When I was deciding what to make this year one thing kept popping into my head, Neapolitan ice cream, a childhood favourite of mine! I don’t know if you remember or ever experienced Neapolitan ice cream, it contained a layer of chocolate, a layer of strawberry, and a layer of vanilla. The only difference with my version is that it is made with natural and healthy ingredients that won’t leave your tummies aching. 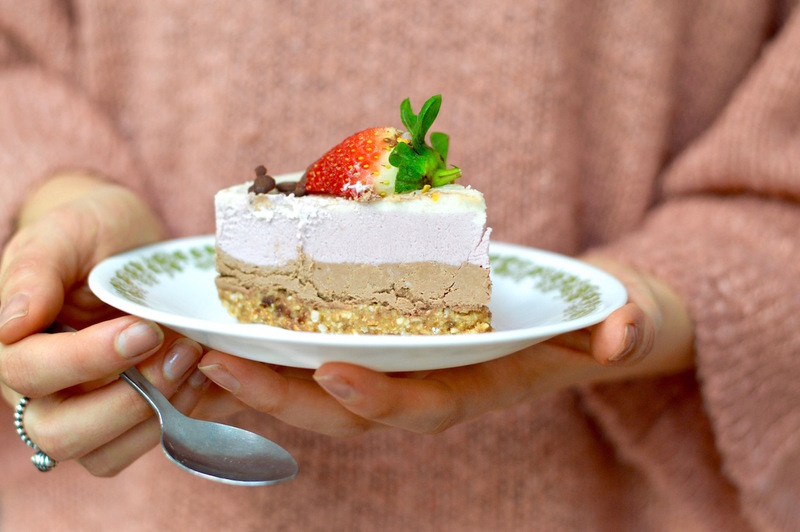 So like a lot of my raw cakes they are always dairy, gluten and processed sugar free! I replace cream cheese for raw cashews which have the same smooth and creamy texture as cheese and they are a wonderful source iron, copper and zinc! 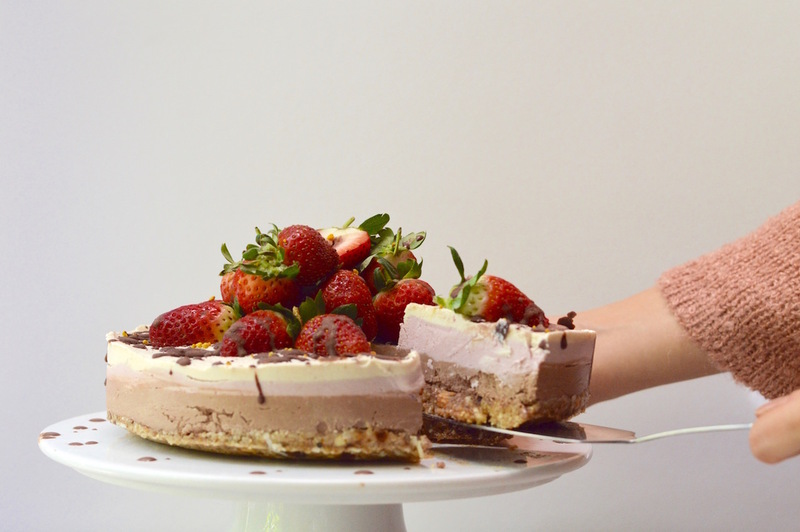 The strawberries really make this cake extra delicious and works so well with the rest of the flavours. Strawberries are in season right now so i’ve been making the most of them. 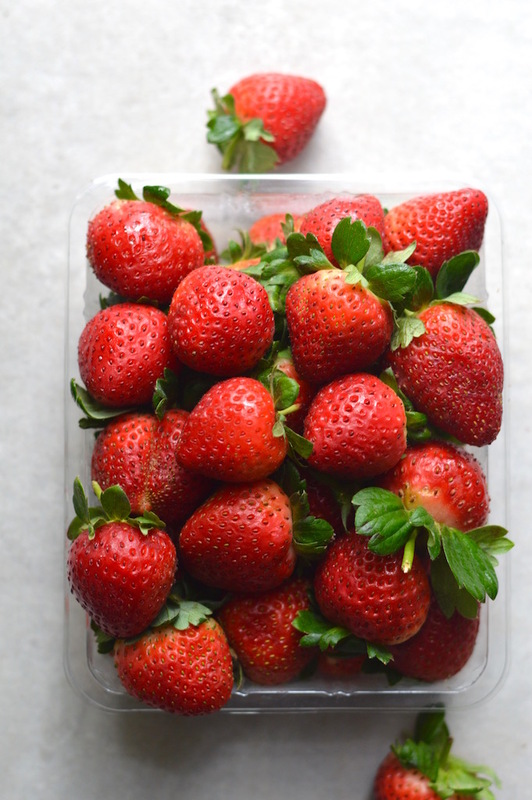 Strawberries are not only juicy and delicious, they are loaded with antioxidants such as vitamin C and have been known to alleviate inflammation and bad breath. Like all fruits and vegetables, try your best to get locally grown organic because you don’t want want all those nasty pesticides in your bodies or in your cake for that matter! For the base, blend together all base ingredients until combined (don't over blend). Line the bottom of a spring form cake tin with baking paper and transfer base into the tin spreading out evenly with fingers. Place in the freezer while you prepare remaining ingredients. Rinse cashews for chocolate layer under water and place in blender along with all chocolate layer ingredients until smooth. Pour into base, spread out with a spoon and place back in freezer for 10-15 mins. Clean out blender. For the strawberry layer, place the strawberry layer ingredients into the blender and blend until smooth. Pour onto the chocolate layer and spread out with a spoon. Place back in freezer for 10-15 mins. Clean out blender. Blend together all vanilla layer until smooth. Pour onto the strawberry layer, smooth out with a spoon and place back in freezer for 6 hours or overnight to set. 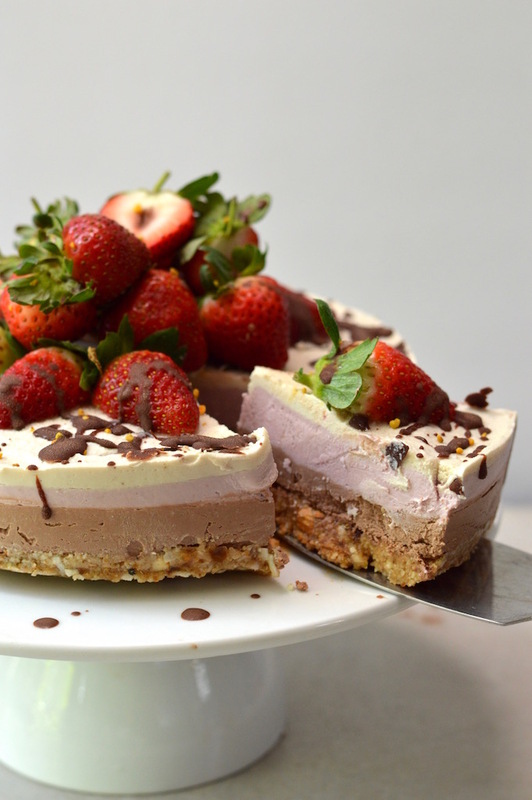 When ready, let in sit out of the freezer to soften, top with strawberries, melted raw chocolate and serve! Store in fridge so for the cake to be nice and soft. Happy belated birthday Tiana! This cake looks wonderful! I plan to make this cake for my friend’s birthday, it looks fabulous and I love that it’s just 2 tbsp of sweetener per layer. 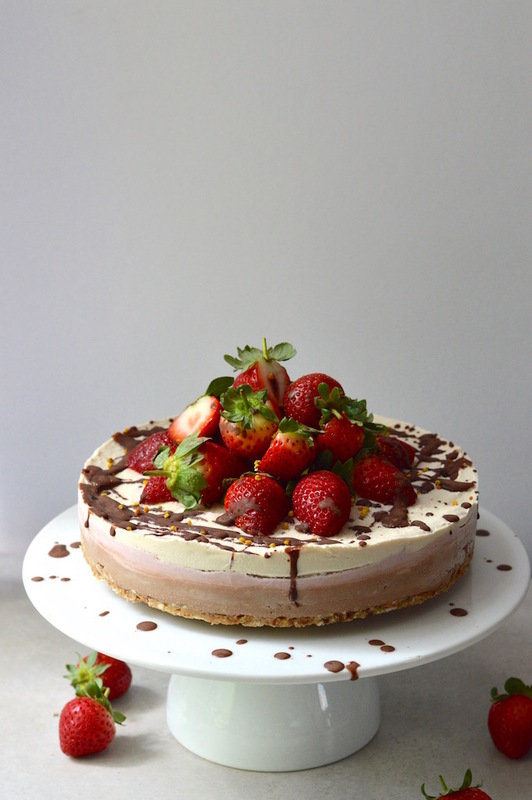 One question – is it correct that there is no coconut oil in strawberry and vanilla layers ? Also I wonder if 1 tbsp of coconut oil is enough for chocolate layer, other recipes usually use 1/2 cup. Thanks for your blog !